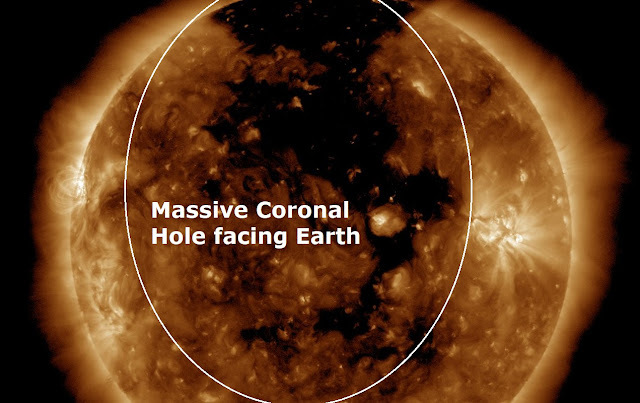 As a massive coronal hole opens up on the Sun’s surface we could be looking at an exciting week ahead for spaceweather. Spaceweather reports: A big new sunspot is rotating into view over the sun's eastern limb see movie below: AR2674 has two dark cores larger than Earth and sprawls more than 150,000 km from end to end. The active region is crackling with minor C-class solar flares. It is too soon to say if bigger explosions are in the offing. To top things off a massive asteroid estimated to be 2.7 miles wide is set to make a ‘relatively close encounter’ with Earth on September 1, just 10 days after the coast to coast solar eclipse across North America. Dubbed ‘Florence,’ the huge space rock will pass just 4.4 million miles from our planet – or, about 18 times the distance between Earth and the moon.